Experience the vacation of a lifetime at Hyatt Ziva Cancun, where sparkling outdoor pools, exceptional dining, spa rituals, and exciting water sports are all part of the adventure. Get all the FAQs on our Cancun resort to enhance your getaway, from how to book spa treatments and tours to culinary requests and the best places for family and group dining. Whether you want to upgrade your suite to overlook the beach or arrange airport transportation, you’ll find it all right here. Enjoy! All of our suites are equipped with standard North American sockets (Type A, sometimes Type B). If traveling with European, Asian or non-North American appliances/devices, we recommend bringing an adaptor. 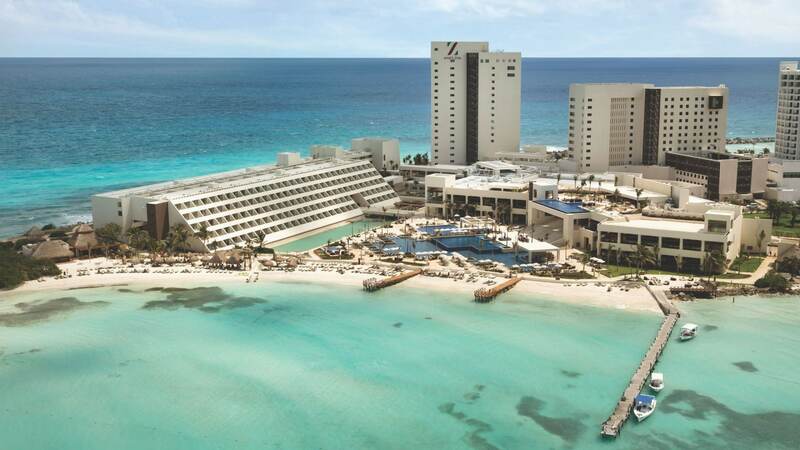 Are kids allowed at Hyatt Ziva Cancun? Our resort welcomes guests of all ages with some minor exceptions: our Turquoize tower is exclusively for adults (ages 18+), La Bastille is an adults-only dining and party venue, additionally, parties held at Punta Vista welcome adult guests only. Yes. A pre-authorized HOLD will be applied as a deposit. For specific details, please consult with Front Desk. Do I need to bring money and exchange my currency to Mexican Pesos when I arrive? Your all-inclusive plan includes meals, drinks, entertainment, and many fun activities. However, we recommend bringing extra cash for off-site expenses, spa services, tours, and transfers. The resort will provide US Dollar to Mexican Peso exchange services, subject to availability. Cash payments are accepted in CAN/US Dollars, and Mexican Pesos. Hyatt Ziva Cancun is a smoke-free family resort, however, we do offer designated areas where smoking is allowed. We recommend not to drink faucet/tap water, the resort will provide filtered and bottled water at all time. Water and ice cubes served at all resort venues are always filtered and safe to drink. Certified by third-party auditors, our resort is compliant to the highest level in industry sanitation standards & best practices. A medical doctor is available on-site on a 24-hour basis, at an additional cost. Certified lifeguards are available in pool and beach areas, first aid is provided on a 24-hour basis for emergency situations. It depends on the items as some restrictions apply due to Customs regulations. Additional fees apply. Are pets allowed at Hyatt Ziva Cancun? Yes, babysitting service is available with a prior request, at additional cost. All drinks and meals are included. On-site entertainment, fitness facilities, non-motorized aquatic sports, hydrotherapy circuit, daily outdoor and indoor activities, in-suite minibar, and free wifi. Tastings and multiple social activities are also part of the all-inclusive package. Please consult our Activities page for more information. We are located a thirty-minute drive away from Cancun's International Airport. Are airport transfers included to and from the resort? Prices are per service, not per passenger. Cancellations must be made 24 hours prior to scheduled pick-up departure, otherwise, cancellation fees apply. Guests celebrating a honeymoon will be greeted with an in-suite complimentary amenity. Additional celebratory amenities are available for anniversaries and birthdays at additional cost. Please contact concierge to arrange prior to your arrival. Resort Formal: Trousers, close-toed shoes or dress sandals, collared short-sleeve or polo-shirts are required for men, women require dress sandals. Elegant evening wear is required for both men and women. Do I need to make dinner reservations? How do I reserve? All of our dining venues are available on a first come, first serve basis. Restaurants close at 10:30pm or 11:00pm. We offer a variety of beers, including Dos Equis, Tecate Light, and Superior. A selection of artisanal beers is also available at Tres Cervezas. Are there age requirements for entering bars or restaurants on the property? Yes, you must be 18 years and older to enter our bars. La Bastille is an adults-only restaurant, and Tres Cervezas is an adults-only venue after 9:00pm. All of our restaurants are open year-round. Some restaurants may close at night during the week whenever there is a theme night, please contact the hotel for details. Yes, at additional. Please contact concierge for more information. Offering an exceptional hospitality experience, our concierge desk will be your first point of contact for any questions that you may have, concierges also offer orientation and assistance in coordinating on-site and off-site services. Our concierge desk is available from 7:00am to 11:00pm. Yes! With our varied resort activities, all guests will find ample opportunities to make new and long-lasting connections with like-minded people. Non ground-floor rooms have balconies, ground floor suites offer a terrace and/or a semi-private swim-up pool. You will be able to purchase tours at our on-site hospitality desk, conveniently located next to the gym. What is the difference between an activity and an excursion/tour? Generally, activities are included in the all-inclusive plan such as pool parties, tastings and fitness lessons. Tours and excursions are optional off-site activities offered by third-party vendors, at an additional charge. Double Deck beach cabanas may be reserved at additional cost, please contact concierge to learn more: econcierge.zivacancun@hyatt.com. No, neither spa nor salon treatments are included. Treatments may be booked in advance by contacting our spa manager: erick.blanco@hyatt.com. Yes, all pools are heated. Yes, subject to availability with prior planning. Additional costs apply. Yes, there are several shopping destinations just minutes away from our Cancun resort. May I partake in all-inclusive experiences at Hyatt Zilara Cancun sister property? Dinner reservations may be arranged in advance with concierge, exchange privileges are for dining only and subject to availability.